Vestal Watch Company is partnering with SeaLegs at the Beach to celebrate the 10th Anniversary of Vestal Village, a new multi-day music and entertainment experience, previously an exclusive invite-only event held on a Lake near Palm Springs during the festival season in April. Vestal Village at the beach will kick-off on Thursday, June 28 in Huntington Beach (Bolsa Chica) and last through Sunday, July 1. 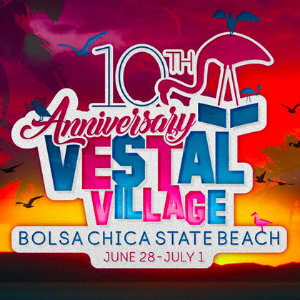 With music at the forefront of everything Vestal does, they are excited to be bringing their annual Vestal Village event to the beach where music fans from all over can experience some of SoCal’s best-undiscovered talent while enjoying drinks and activities throughout the weekend. Guests will enjoy the musical stylings of various up-and-coming artists including Spend time Palace who recently graduated from Newport Harbor High and have over 2 million views on their first video release. They also included some familiar names that have strong Socal ties such as the Black Lips, Mickey Avalon, Cailin Russo (Scott Russo of Unwritten Law’s daughter) and Dead Sara which is fronted by LA native Emily Armstrong. On Sunday they will be bringing a Sunday Funday vibe by having Poolside headline a group of artists as they spin daytime disco beats. For those of you wanting the full festival experience, they offer fully furnished glamping tents on the sand and with oceanfront views or bring your own RV or yacht. Tickets begin at $99 for a 3-Day event pass from 10 a.m. - 9 p.m. Friday, Saturday and Sunday. Partygoers also have the option to purchase add-ons such as the After Party Pass including bottomless beer and wine for $99. Camping and “glamping” tickets are also available online. For more information about the Vestal Village 10th Anniversary celebration, please visit, vestalvillage.com/vestalvillage/.